I go back far enough to remember when Radio 2 (and Radio 1) closed down at midnight and didn't come back on-air until 6am. There was nothing but dead air, save for the occasional test tone. Insomniacs and night shift workers (always the two 'groups' that are trotted out on these occasions) could only get their overnight radio on Luxembourg, until 3am, the World Service, one of the many foreign stations on medium wave and long wave or one of the few ILR stations that provided a 24-hour service. All that changed, at least as far as Radio 2 was concerned, when You and the Night and the Music filled the 'gap' from January 1979 and there was a friendly voice, picked from the team of continuity announcers, to either lull you to sleep or keep you awake, depending on whether you were operating heavy machinery or not! 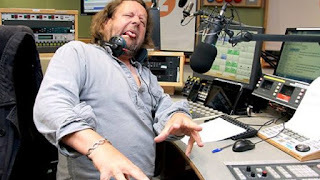 I mention this bit of radio history in light of the announcement from Radio 2 this week that from next month there will be no live overnight programmes on the station between midnight and 5 am. (And indeed from 10pm to 5 am on some nights of the week). All due to budget cuts of course. The fallout from this is the loss of Janice Long and Alex Lester, aka The Dark Lord, both of whom enjoy a loyal following. Those overnight shows apparently pick up an audience of about 900,000. Huey Morgan and Bob Harris's shows at the weekend remain unscathed, and re-scheduled at a more user-friendly hour. In their place we are promised the continuation of the repeat of some music shows, e.g. Pick of the Pops, Sounds of the 60s and, rather more curiously, Radio 2 Playlists "which are uniquely curated by our leading music presenters and music team and that our audience can enjoy on the radio or on demand". In other words a 3-hour jukebox service. The fact that it can be enjoyed "on demand" is a little disingenuous; so can the rest of Radio 2's output including the shows that currently get an overnight repeat. And while we're on the subject since when did "curated" replace "selected" or "chosen"? So far the reaction to this announcement has, understandably, been critical. How can what is claimed to be Europe's top music station not offer live overnight radio? Why cut the After Midnight shows when other presenters (insert name here) are paid mega-bucks? Given that the big commercial groups offer live radio in the wee small hours why can't the BBC? By my reckoning this change pushes the total number of pre-recorded shows (or not live) from 19% to 32% of the station's weekly output - the actual figure depending on whether or not Paul O'Grady makes it into the studio and if Dermot O'Leary is on X Factor duty. After 38 years of night-time broadcasting it's a pretty sorry state of affairs when a substantial part of the station's listenership are disenfranchised and can no longer enjoy the intimacy and companionship that only live radio can offer. As for Janice and Alex they will, we are told, continue to broadcast on BBC radio. The reality is, I suspect, that we'll see them get a regular gig on BBC local radio. You can hear Alex Lester talking candidly to Stuart Clarkson about Radio 2's decision on this week's Radio Today podcast. The current schedule with two hours of overnight repeats started in October 2014 but Radio 2 wasn't averse to putting out repeats before, albeit limited to just an hour. When You and the Night and the Music (1979-84) started it was live music and chat with pre-recorded features. The budget was a pittance and needletime so restricted that it only allowed for two records in a 3 or 4 hour show. An hour's worth of repeats of the like of Two's Best or Folk on 2 started in 1982 but between 1985 and January 1990 it was music all the way with an hour long sequence called A Little Night Music filling the gap. Again there were repeats in 1990 and 1991 but the majority of the overnight hours consisted of Night Ride (which incorporated A Little Night Music until July 1992) and an early show kicking off at 4am, both presented by a roster of continuity announcers. Alex Lester started his reign as king of the overnights from September 1993 with a 3am show. The Night Ride title was dropped in 1995 but the presenters remained unchanged with either Steve Madden or Charles Nove taking the lion's share of the midnight to 3am slot. By late 1998 Katrina Leskanich was drafted into the post-midnight show until April 2000 when Janice Long took over. Alex and Janice have remained as the main weekday overnight presenters ever since. Worth mentioning that Sunrise Radio, not quite the biggest or most heavily funded station in the UK, has just introduced what I think is live presentation overnight this month (certainly it isn't non-stop music as it previously was). And what has happened to the Radio 2 playlist lately? I listen to R2 not just because of the music they play but also because of the music they DON'T play. Since a couple of months ago the station has been playing songs that would never have made it to the playlist previously (TLC feat. Snoop Dog being an example). I almost feel embarrassed for the presenters who are having to broadcast some of these songs. If I wanted to listen to this stuff, I'd tune in to Capital or Heart. Come on Radio 2 keep your identity, don't try to be something you're not, something your listeners don't want.